These quotes were pulled primarily from the opening paragraphs of articles sourced through a Google search for "melting permafrost." Cobbled together as if from a singular source a world begins to form, one that fluxuates between realms of specificity and vaguery, between dire straits and halcyon days. Certainly these quotes were not from the same article, because that's not how articles work, but that is how worlds work. The exhibition is not meant to question the veracity of climate change, but the manner in which we discuss it. The space of ambiguity created by both sides of an arguing population that is or isn't currently being roasted to death by their own home, is far more interesting than the truths that they claim to espouse. The Earth is heating up. The Earth is not heating up, and even if it is...did we have anything to do with it? The discussion of climate change has affected it's own change of the climate in the media, where words like "doomsday' and "apocalypse" have become common parlance, meant to shock an overwhelmed audience into action. When the Winters Were Still Really Cold was conceived in response to the multitude of articles that appeared in May of 2017 about flooding that took place at the Svalbard seed vault. The flooding was due to higher than normal temperatures on the Norwegian archipelago, resulting in a mix of thawing permafrost and rain during a period that would usually see snow. The media quickly wandered into the realm of hyperbole, and a project which was created to endure such cataclysmic end times was experiencing them first hand. Little does it matter that those thawing temperatures quickly subsided and the flood waters in the entryway froze into a comical ice rink guarding a treasure trove of the world's seedlings like a booby trap for a post-apocalyptic agrarian Indiana Jones. As many scientists will attest, there is a lot we don't now about climate change. Be it truth or speculation, the internet has created a platform at which all information about the subject is available to us immediately, and the media is facing the need to provide that immediacy as well. But this immediacy is left open ended, the stage is set, the world of 100 wildfires is introduced, the plot thaws out, and the audience is left without a clear ending. It's the media's job to keep you abreast of what's happening, but it's become the audience's job to find out what happened. The seed vault was fine, it always was, but the wildfires are still burning. Exploring the role of the artist in the conversation of climate change, When the Winters Were Still Really Cold builds part of the stage for The Setting, the first part of a nine month series of exhibitions called The Temperature. 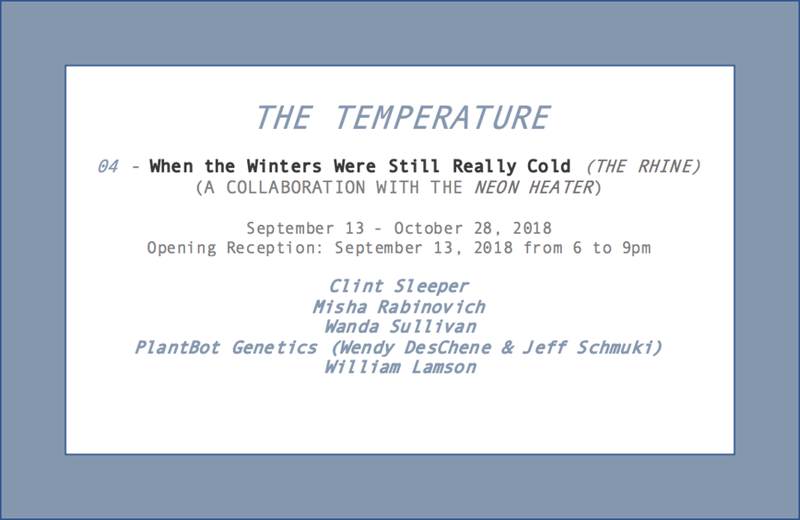 The Temperature is a curatorial project of The Neon Heater, an artist run space in Findlay, OH. As part of their seventh year of exhibitions, The Neon Heater will be curating a series of 30 exhibitions across the United States between September 2018 and May of 2019. A loose conceptual narrative will connect the exhibitions via a monthly framework that unfolds throughout the course of the year. The narrative is a critique of the Art world and capitalist art market, American nationalism and exceptionalism, and universalized Hollywood blockbusters. September's monthly theme is The Setting.